Last month I had the honor of having my painting "The Early Universe" in a juried show at Viridian Artists gallery in Chelsea, NYC. The "29th International & National Juried Exhibition" was juried by Johanna Burton, Director and Curator of Education and Public Programs at the New Museum. She sifted through over 1200 pieces of art submitted by over 400 artists and whittled it all down to a 25 pieces by 25 artists. Shockingly, "The Early Universe" made the cut. Like so many artists, I'm forever submitting my work via online call-for-art forms, paying $25-$50 entry fees, hoping for the best, resigned to the inevitable rejections, pressing on with art making in a psychic cloud of obscurity. Needless to say, what a confidence boost, right? Becoming intimately familiar with I-95 and the Lincoln Tunnel was a small price to pay for getting to show in a great Chelsea gallery, on the same block, incidentally, as a swank Zaha Hadid luxury condo overlooking the High Line. Attending the opening and meeting some of the other artists and Viridian staff was a blast, as was taking a sunset stroll on the High Line and grabbing a fantastic Argentinian meal nearby. It's good to get out once in a while with a quick dive into the NYC culture pool. As a side note, this is the second time "The Early Universe" was selected for a group show, the first being this past winter at an InLiquid-curated show at The Painted Bride Art Center in Philadelphia. I wonder what that means. Should I be making more of this type of work? Is it hitting some sort of curatorial pleasure nerve? It's currently back over my fireplace mantle. A good shirt is crucial if one is to project proper artist vibes. It started off as a piece of heavy duty plywood I liberated from a dusty basement. It had a striking grain pattern that suggested contour lines on a topographic map, and I would occasionally stare at it propped up over there in the corner, the grain's pattern repeating, altered slightly in each iteration, an artifact of the board's manufacturing process. I'd been wanting to work up a large piece on a board owing to my unfortunate tendency to lay my hand on the surface while painting or drawing - problematic when working a canvas. I was thinking maybe it would involve collage. I applied gesso, following the board's grain pattern. Then slowly the vibrations appeared, or were they tails of Chinese dragon kites? Streamers or rivers? Yes. Two rivers appeared, along with overlapping circles reminiscent of my previous painting "Emergence : Refraction." Other pattern making emerged, following the contour lines. I worked horizontally right to left (flip the image 90 degrees clockwise in your mind). Then came the guitar strings, followed by the railroad hugging the canyon walls. The latter played across the land, the former played the land. Or something like that. After months of work, it was coming together. Except for the right third. What to put there? How about the colored blocks? Right. You don't know about the colored blocks. Time travel back to 2016. I'd spent weeks sawing square dowels (can a dowel be square?) 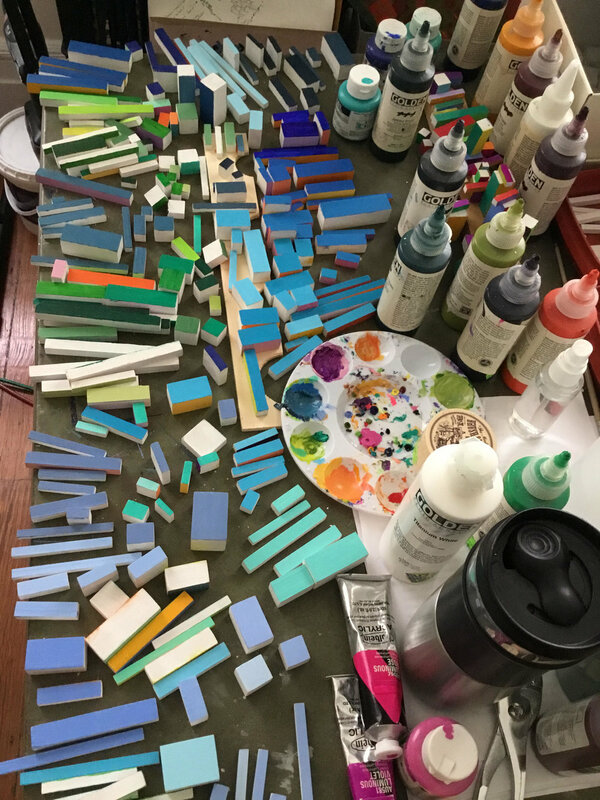 into small blocks, sanding them, applying gesso, then painting: greens on one side, orange/reds on the next, blues on the next, and finally purple/pinks on the last. Then varnish. It took freakin' forever. When vertical, the hypothetical block array would change color type depending on your orientation. I thought maybe they'd appear in a stand-alone piece and did some preliminary position experiments but I never quite felt confident enough in an arrangement to commit to gluing them down. I did get close, though, and almost committed to the below array concept. But what to do with the rest of the board? Leave it blank? Paint it? Plain? Patterned? Collage? Competing ideas bounced around uncomfortably for weeks. Any idea for the blank areas seemed to detract from the impact of the blocks. The city-like array looked best displayed on a board laying flat so one could walk around it (see video), but who has space for that kind of thing? Famous artists in their massive airy lofts, not me and my cramped 12' x 12' studio. It would look great under glass as a coffee table, but my carpentry skills are pretty rudimentary and making a table seemed daunting (and expensive!). Future project? Back to the emerging landscape: why not go vertical with some building-like structures massed in the empty area? Would the craft glue I got for mounting the blocks work? Would the arrangement work? I needed to test out the proof-of-concept with the glue. I had some blocks painted prior to my 4-sided color scheme (radical non-conformists), so with those I made a separate, smaller work, with some variations on my overlapping circles, sort of a day/night skyline portrait titled "Side 2/Side B." Looks good hanging along the stairs - the above and below views change depending on one's orientation. The glue works! Proceed with commitment! Oh wait, have to make a frame that can handle the weight of this thing. Hat tip to my neighbor with the pre-safety table saw. Special thanks to the plywood for showing me the lay of the land. Only took the better part of a year to make, which might put this project into epic folly territory. Only later realized the title may refer to The Who's "Amazing Journey" - namely the line "he's in a quiet vibration land." Which may be a fair critique of where I'd rather be than where so many of us have been since the 2016 election. See my post here on the I Think Like Midnight blog about making art in the age of fear and loathing. 23.5" x 49.5". Please get this thing out of my home. Tags Andrew Chalfen drawings, painting, mixed media, "Vibration Lands"
I chose eleven of my creations and have been uploading and positioning the largest files I can generate onto the Society6 platform. So click on through here and see what you like. Society6 is known for their high quality printing and products as well as top-notch customer service. If you purchase prior to December 14, your items should arrive by December 25th. There are also coupons and frequent sales for Society6 floating about their site and mailing lists. Their search engine doesn't seem to favor newbies for some reason, so find my stuff through the links above. If you are feeling spunky, perhaps even click on the "like" hearts by each product you fancy and tell your friends that their lives could be filled with pop art psychedelia if only they'd open their m̶i̶n̶d̶s̶ wallets. And yet somehow, they find a way to get along. The coloring book completed, the arms, fingers, and soul rested. It also began to think again about paint. Thoughts marinated, fermented, and the results were close to, if not just as good, as the perfect half-sour pickle. As the paintings took shape, it became apparent that these were portraits of sorts. Currently they appear to be siblings, though they could be also categorized as moods. They feel tryptych-ish, needing one another for comparison and distinction. If they wind up on your wall, you can display them as you see fit. That is your right and don't let anyone try to tell you otherwise. After a 7-month pause for working on the coloring book, I declare this painting finished. I had just begun to play around with some of the freehand forms that have appeared in my drawings when opportunity struck. The painting waited patiently on its easel while I worked with black pens and looked longingly at color. Title: "Topographia." Otherwise, the title would've been something like "Topographia Vietnam Chakra Intestinal Terrain Chi Interior Macro Battle Adjustment: Tactics, Strategy and Alignment Continuum." Acrylic on canvas. 12" x 36"
It will be on display at Renaissance Healing Arts, 1004 Pine Street when I get it together to drop it off to them. Itchin' for a colored pencil, are you? I am rather chuffed, thrilled, excited, pink-tickled to announce that I will be a published illustrator! Since late December I have been working on creating a coloring book for Thunder Bay Press which is slated to be published on February 4, 2017. It will be 96 pages in a cool 10" x 10" format and will feature illustrations with the broad theme (and tentative title) "Look Up." I am incredibly grateful to Thunder Bay for taking a flyer on me in what some have called a "saturated market" for adult coloring books. It's an amazing opportunity and is pushing my artistic boundaries and getting me to think in new ways. I am rather stoked to see my work in Barnes and Nobel and Target, too. Above all, it's mind-boggling that colorists who buy this book, perhaps thousands, will be fellow artistic collaborators. I really hope they post their completed art on my Twitter and Facebook pages. More soon! There is much exciting activity afoot. A number of my drawings will be included in a group show at the James Oliver Gallery. The opening is February 20 at 6pm. The show goes through March 26, so you'll have lots of opportunities to go visit the drawings, talk to them, ask them questions, purchase them (if you are so inclined) and offer them snacks. Click here for the Invite on Facebook and here for the J.O.G. website. J.O.G. is located at 723 Chestnut Street, 4th Floor, Philadelphia, PA. Hours: Wed-Fri 5-8pm, Saturday 1-8pm, or by appointment. Andrew Chalfen, Office 1, Ink on paper. 2008. Andrew Chalfen origin myth. Not illustrated by Jack Kirby.